Many months have passed with no blogging!!! 2010 has so far not been too kind to us but things are beginning to change - in August, we are going to be grandparents!!! Unfortunately my son is in Johannesburg but we will just have to make a trip up there as they don't come to Cape Town very often. 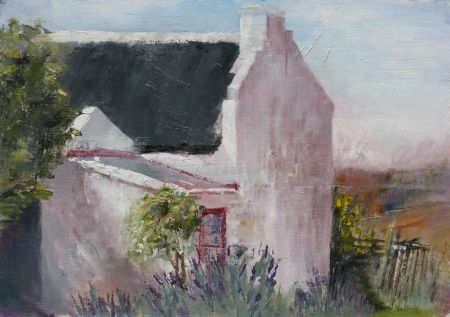 Back to my painting - we started off the year painting at an Eco village in Pinelands called Oude Molen. This is a side view of the little restaurant. To the right is a big veg garden which supplied us with beautiful tasty fresh veg for the duration of our stay at a very reasonable price. I also bought some horse manure for my compost heap. Hi Carol, Have missed your posts. Love this painting of this sweet little building. Thanks Barbara, it is great to be back. I have so much to upload! No doubt about it - plein air is your 'thing'. I remember you starting this, but great to see the finished painting. Thanks Liz. Yes, I am hooked on plein air!